Carded wool :: Carded Wool Natural Colors :: BrownMelange carded merino 23 mic. 50gr. Home/Carded wool/Carded Wool Natural Colors/BrownMelange carded merino 23 mic. 50gr. BrownMelange carded merino 23 mic. 50gr. Minimum quantity for "BrownMelange carded merino 23 mic. 50gr." is 2. Australian carded wool 23 micron from ECO-HOBBY WOOL AND FELTING LTD factory made from high quality Australian raw materials. 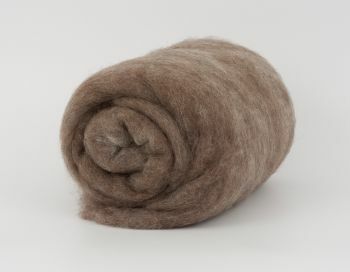 Carded wool from our factory has no analogues on the market, as it is made by special technology with re-combing (standard carded wool even ultra fine wool is a woolen wadding combed only once and therefore contains a permissible amount of impurities in its composition and fibers of different lengths). Our production is perfectly clean with the same length woolen fibers (the fiber length is not less, than 6 cm) and most importantly – it is a multilayer! This means, during your work, you do not have to tear wool into pieces and spread it piece to piece. You can separate one slice from our carded wool by your desired layer thickness and spread it on the template entirely, which saves your time and effort and give you a very smooth high quality felt! With our material you can operate fast and convenient. Australian carded wool from ECO-HOBBY is ideal for wet and dry felting, interacts well with all natural materials and fabrics. Purpose: felting toys, handbags, shoes, interior items and other. We work for you, and we have made every effort to work with our product been for you a comfortable, pleasant and fast!